Poets weren’t always writers. Like musicians, they were originally performers as well who created invisible worlds out of sound. When something is repeated in a poem, the repetition opens possibilities for meaning. It could be that we want an idea or feeling to escalate in importance. It could be we want to create a sense of incantation or chant. Repetition creates a certain rhythm in a poem. It intensifies meaning and creates a sort of gathering of forces – a forward momentum. Sometimes when we repeat something over and over, its original meaning seems to disappear. What is left? What could it mean now? Look at ‘Homage to Kenneth Koch’, written as a group poem by students and originally published in Mutes and Earthquakes. The repetition of ‘I used to’ and ‘but now’ suggests stories about lives – some of them sad, some funny, some mysterious. Notice how including concrete details keeps the poem lively and visual. We can imaginatively engage with the ‘soft white room’ and singing of apple trees. In the poem, one thing or action ‘speaks’ to the other – e.g. ‘I used to stutter sound/ but now I stutter whole words’ and ‘I used to know nothing/ but now I am deceived’. The connections are not random – they make a kind of sense together. Write a poem in the style of ‘Homage to Kenneth Koch’ using ‘I used to’ followed by ‘but now I’ all the way through the poem. The poem can be written individually or as a group. Either way, when you have finished the first draft it’s interesting to consider the arrangement of the poem. What is the best image to open the poem? Maybe go for an ending that is unexpected. Think about surprising your reader. Don’t worry too much about getting things right in the first instance. Just write. Let your instincts take you where they want to. Then look at the poem. Is there a link between each admission of what used to be and what is now? I used to tear, but now I crumble. but now I live inside them. to any more slack do’s at Plunket. but now I stutter whole words. of a soft white room. but now I wear it short. I used to be young but now I avoid time. but now I am deceived. I used to, to, to . . . But now? I used to be brilliant, but now I’m cured. Lynn Davidson’s most recent book Common Land was launched this month. She is the author of three previous collections of poetry, How to live by the sea, Tender and Mary Shelley’s Window, and a novel, Ghost Net. 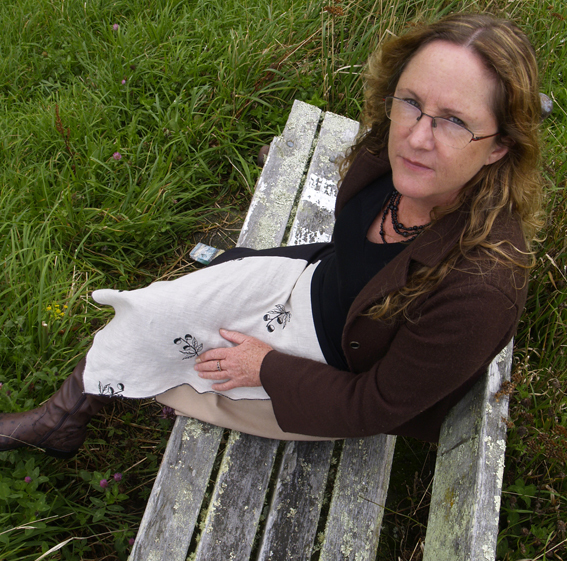 Her poetry has been included in Big Weather, poems of Wellington, The Best of Sport Magazine, The Best of Best New Zealand Poems and PN Review. In 2003 she was awarded the Louis Johnson Writer’s Bursary and in 2011 was Visiting Artist at Massey University where she is currently working towards her PhD. You can see Lynn read this Sunday at ‘Poems on the Vine’ at the Gladstone Vineyard with Helen Heath and Michael Harlow. The MC will be local Wairarapa poet Pat White. For tickets or further information, contact Hedleys Bookshop. 150 Queen Street, Masterton. Ph: (06) 378-2875. Email: sales@hedleysbooks.co.nz.